In the Alps, with its large corps of professional guides, organized rescue is all part of the business. In North America, mountain rescues are commonly carried out by volunteer organizations. The volunteers use their rescue training and knowledge of the local mountains to analyze a situation, decide a course of action and carry it through. They round up the needed equipment and rescuers from among local climbers who are on call for emergencies. In the state of Washington, for example, Mountain Rescue units are headquartered in the major cities. Rescue evacuations usually require a leader and from eighteen to twenty-four stretcher bearers, unless a helicopter does the job. In most areas, official responsibility for rescue rests with an agency such as the county sheriff's department or the National Park Service, and relatively good condition can be roped in with two or three companions who then glissade slowly as a team, constantly under control. Rescuers can set up anchors for belays and for braking devices by using pickets, bollards, or deadman anchors such as snow flukes or buried ice axes. (Chapter 12 gives the details on setting up these anchors.) 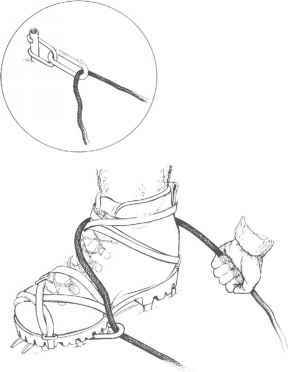 The boot-axe belay usually is not strong enough for use in rescues. Moats often provide superb anchor positions for lowering.